Investors have called on the world’s biggest soy companies to make firm commitments to end deforestation in wildlife-rich areas of South America such as the Cerrado and Gran Chaco. Those that fail to do so risk being exposed by environmental activists to consumer boycotts, legal action and falling profits, experts warn. Investors are leading the way as companies fail to appreciate the scale of the crisis, campaigners say. 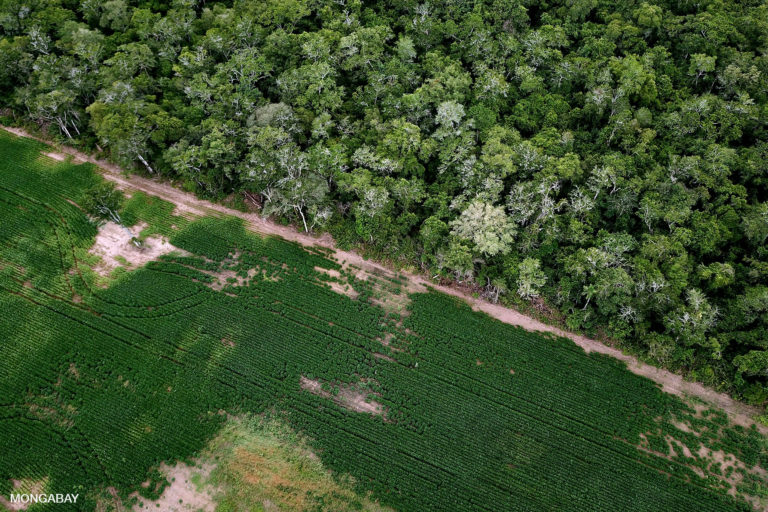 The world’s leading companies involved in the soy trade are being challenged to come clean about their impact on the environment and to completely eliminate deforestation from their operations. The production of soybeans is one of the leading drivers of forest loss in South America, with Brazil’s savanna-like Cerrado region, which covers 20 percent of the country, especially vulnerable. But institutional fund managers believe those companies that contribute to deforestation, and the associated rise in greenhouse gas emissions, from their involvement in the soy industry are taking risks with both their financial performance and their reputations. For example, there is a real danger of consumer boycotts or legal action as a result of being involved in illegal deforestation or human rights abuses. “If you’re a company that’s operating in a deforestation hotspot such as the Brazilian Cerrado, there is a lot of pressure at the moment from outside stakeholders to reduce that,” said Julie Nash, director of food and capital markets for Ceres, a nonprofit organization advising on issues ranging from climate change and pollution to human rights abuses. Nash said companies such as Unilever and Nestlé have committed to zero deforestation and total traceability of their supply chain. “There are leaders,” she said. Since a moratorium on deforesting the Amazon to create new soy plantations was agreed to in 2006, the focus has largely shifted to the Cerrado. An area of savanna and woodlands that once covered 2 million square kilometers (772,000 square miles) — greater than the state of Alaska — the Cerrado has since lost more than half of its natural vegetation to make way for agricultural production in the shape of cattle ranching and soy. More than 100,000 square kilometers (38,600 square miles) has been converted in the past decade. An estimated 43 percent of its plant species are endemic to the region, and more than 300 species of fauna and flora are threatened with extinction. The Cerrado is renowned for being the stronghold for charismatic species such as the maned wolf (Chrysocyon brachyurus) and giant anteater (Myrmecophaga tridactyla). Also at risk is the Gran Chaco, a unique area of dry thorn forests and seasonally flooded wetlands covering some 1 million square kilometers (386,000 square miles) across Argentina, Bolivia, Brazil and Paraguay, which lost an average of nearly 3,000 square kilometers (1,160 square miles) a year in Bolivia alone to soy plantations between 2011 and 2015. In total, 57 institutional investors with assets totaling $6.3 trillion have supported the release of a statement calling on all companies in the soy supply chain to “demonstrate commitment to eliminating deforestation” by publicly disclosing their policies on the issue, saying where their soy comes from, and describing how they will deal with suppliers that fail to comply with no-deforestation standards. The investors, which include Aviva, Legal & General and BNP Paribas Asset Management, will engage with more than “25 of the largest, publicly traded companies in the soy trading, processing, manufacturing and retail sectors,” Nash said. That category includes companies such as Bunge, a multinational operating across the globe in a wide range of commodities, but not another of the soy heavyweights, Cargill, which is privately owned. Adam Kanzer, head of stewardship-Americas for BNP Paribas Asset Management, described the statement as a “very clear blueprint” of what they would like to see companies do to show their commitment to reducing their impact on the environment. 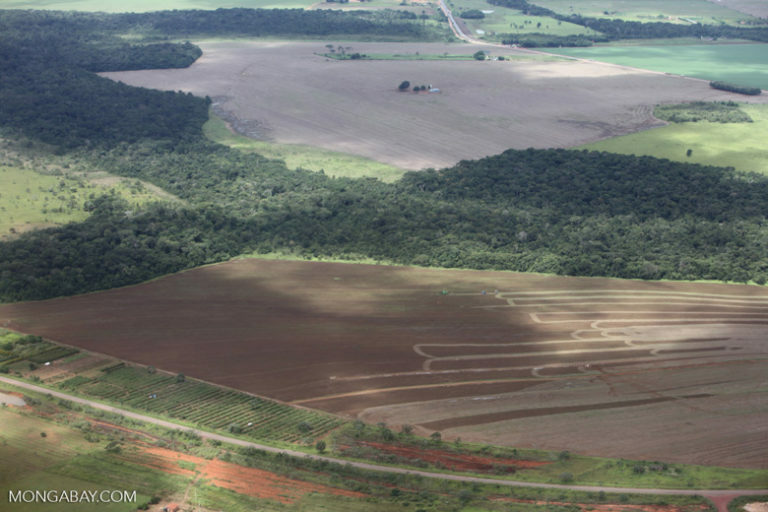 The U.S.-based NGO Mighty Earth has campaigned on the issue of soy impacts on the Cerrado and other forested regions of Latin America over many years, and campaign director Anahita Yousefi told Mongabay the group supported this initiative. Yousefi warns that while investors appeared to be taking the issue seriously, the companies themselves had largely failed to do so, citing the case of Bunge, one of the largest companies involved in the soy market, which she said had made public commitments on eliminating deforestation but failed to follow these up. Soy field and cerrado / chaco / Amazon transition forest. Photo by Rhett A. Butler for Mongabay. “We felt there was some substance to their engagement on this issue, and we were so disappointed by seeing Bunge not taking it seriously,” Yousefi said. 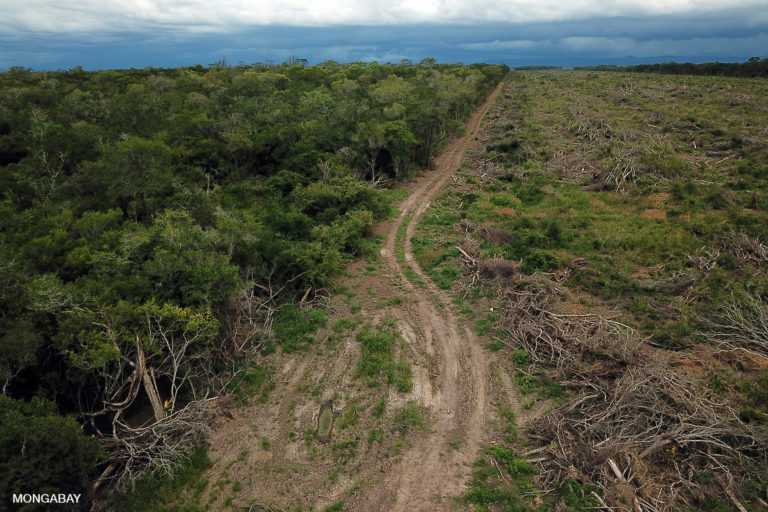 Yousefi also warned that companies investing millions in plantations in the “frontier” regions of the Cerrado and the Gran Chaco are risking the future of their businesses because the loss of natural vegetation could impact rainfall. Bunge was among five trading houses fined a total $29 million last year for purchasing soy grown in areas that had been put off-limits by Brazil’s environmental protection agency, Ibama, to allow native vegetation to regrow. In a written statement, Bunge told Mongabay it was working with both the Soft Commodities Forum and the Cerrado Working Group to address deforestation in the region. “We have board oversight, a supply chain specific commitment, and a timebound goal for achieving deforestation-free supply, and we publish data on our traceability and monitoring activities,” said Steward Lindsay, vice president for sustainability and government affairs. Forest in the transition zone between chaco and cerrado biomes being cleared for soybeans. Photo by Rhett A. Butler. The initiative was also welcomed by Washington, D.C.-based consultancy Climate Advisers, which recommended this sort of action to investors in a report published at the end of last year, not just because of increased carbon emissions resulting from deforestation but also because of the impact on companies’ profits. 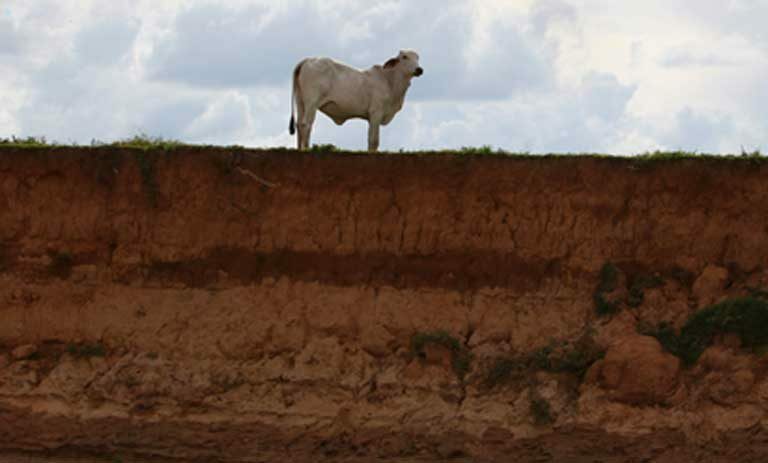 Banner image: The Brazilian government’s revamped Terra Legal program could open the way for cattlemen and soy growers to make major land gains across the Amazon and Cerrado. Photo by Rhett A. Butler. About the reporter: James Fair is a wildlife conservation and environmental journalist based in England. You can find him on Twitter at @Jamesfairwild. FEEDBACK: Use this form to send a message to the editor of this article. If you want to post a public comment, you can do that at the bottom of the page. Editor’s Note: A previous version of this article identified BNP Paribas Asset Management as a bank called BNP Paribas. 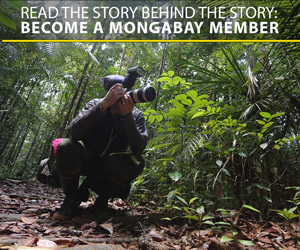 Mongabay regrets the error.